The University of Sydney approached Switch I.T. 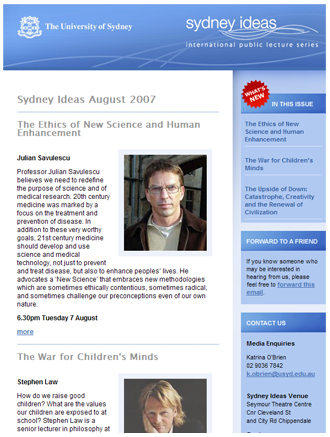 to assist them with promoting their Sydney Ideas Lecture Series. Our multi-part template allows for their campaigns to be sent in both HTML and TEXT whilst remaining ensuring we're seeing the template rendered as we intended it to be. Open rates are growing and each campaign has been instrumental in seeing the popularity of these events rise. Sydney Ideas campaigns have been running successfully for over 6 months now, open rates are increasing, click throughs are strong and new subscriptions are also on the rise. SynergyMail is all too easy and ensures that the University of Sydney can get notifications of every new event out to their subscribers in seconds. To ensure full compliance with the Australian SPAM act, the University of Sydney has several small but important tweaks to keep them compliant. - Web Friendly Version of every campaign. The brand from the University of Sydney is nice and modern, this fresh look allowed us to really make the templates look top notch. Not to mention they look equally impressive in just about every email client know to nerdkind - standard testing occurs with common desktop email clients like Outlook all the way through to popular web based email clients like Gmail. Scanning an email is exactly what most recipients do, with this campaign it is really easy to discern each article as well as getting a great look at some top images.